Sunstar padded into camp with Dustface close behind. Dustface went to go check on Lionpelt. Sunstar padded towards the nursery and layed down with her kits. Lionpelt nuzzled Dustface Where is TigerClaw and OwlFrost? she asked. Forestkit thrashed her tail. She looked more mature, strong, fast, quick minded, her pelt was darker, and her voice as not squeaky as it used to be, it was more deep. Mintkit shook his pelt. The same changes were in Mintkit as well. Nickelkit, Amberkit, Brookkit, Mosskit, Goldenkit, Shinekit and Firekit had many changed in them. Sunstar jumped onto the highrock. Let everyone in the Clan gather for a Clan meeting! She yowled. Nickelkit, Amberkit, Brookkit, Shinekit, Firekit, Mosskit and Goldenkit gathered. Dustface got up. You will see. He mewed. Sunstar looked down on her Clan. News of Owlfrost and Tigerclaw being banished has already spread through the forest. It is true. They trespassed on too many other territories and it is comfirmed that Owlfrost is now a kittypet. I want you all to keep a sharp eye out for Tigerclaw though. She meowed. She then got into a brighter mood. Amberkit, Goldenkit, Mosskit, Firekit, Brookkit, Shinekit, Nickelkit, Mintkit and Forestkit step up. She mewed. Since there are so many of you, I will name you all at once! From now on, you all will be known as; Forestpaw, Mintpaw, Amberpaw, Nickelpaw, Brookpaw, Mosspaw, Goldenpaw, Firepaw and Shinepaw! She yowled. Goldenpaw, Mosspaw, Amberpaw, Firepaw, Shinepaw, Brookpaw and Nickelpaw all purred in excitment. 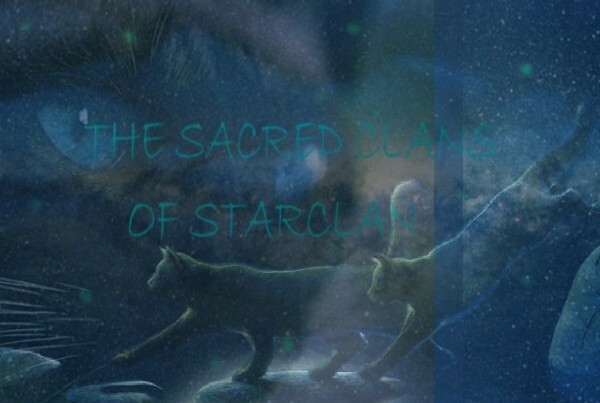 Sunstar smiled as her Clan grew. Amberpaw, Goldenpaw and Mosspaw headed to check out the apprentices den. Nickelpaw and Shinepaw were practicing fighting moves. Firepaw and Brookpaw were sunning themselves. They seemed inseperable. Forestpaw went over to a rock, she as like her mother, strong, but shy, lonely, but fierce. Mintpaw went off and played with the other apprentices. Goldenpaw purred and jumped onto Mintpaw. Mintpaw went to the ground and smiled, he bucked Goldenpaw off of him and pounced on him. Forestpaw kept her eagle eye on Amberpaw. Wolfclaw smiled and shook his pelt. Amberpaw had his amber eyes on Firepaw and Brookpaw. Cloudface and Haretail bounded into the clearing with their tails intertwined and their mouths full of large hawks. They had been in pursuit of the birds for days. Sunstar welcomed back her warriors with a purr. Dustface bounded out of camp but soon came back with four squirrels in his jaws. Brookpaw got up from Firepaw and padded away. Firepaw jumped up and stalked off the other way. Amberpaw turned around quickly and saw Forestpaw staring at him. He smiled weakly and stalked off to go hunting with Firepaw, Nickelpaw and Sunstar. Mintpaw saw his sister gazing at Amberpaw with her narrow eyes, he walked over to her Are you ok......? Forestpaw nodded I am quite fine she said, wrapping her longtail around herself. Wolfclaw meowed a good bye to Sunstar. Sunstar mewed back to him. I wont be gone long. She purred dashing out like lightning. Amberpaw, Nickelpaw and Firepaw smiled to each other and raced after their mother with the same speed. Dustpelt licked the fur on his chest. Runningwind was just coming back with five squirrels. Forestpaw looked at the ground. About twelve minutes later the four cats returned with enough to feed all four Clans and more. With skills like mine, and all my warriors and apprentices, we could be well fed until newleaf three times over. She said dropping her voles, squirrels and birds. Nickelpaw dropped six voles, seven mice and three thushes. Firepaw dropped a hawk like bird in the pile along with six mice. Amberpaw had the biggest catch. He had seven squirrels, nine mice, three thrushes, a chaffinch, four fish and a large hawk with talons sharper than a foxes fangs. Forestpaw looked at Amberpaw and his catch, showing no emotion. She was much like Warstar in her personality, quiet, but fierce, a warrior for blood, but kind at heart. Mintpaw looked at his sister with pure suspicion. Sunstar yawned. Im going to retire to my den now. Dotn destyroy the Clan with that fierce hunting skill Amberpaw. Sunstar laughed heading towards her den. Amberpaw mewed good-bye to his mother and began to tumble with Firepaw, Nickelpaw and Brookpaw. Runningwind was grooming his fur.